This fun self-assessment scale with Chili Peppers is a great way for students to reflect and self-evaluate how they are doing in their own learning. 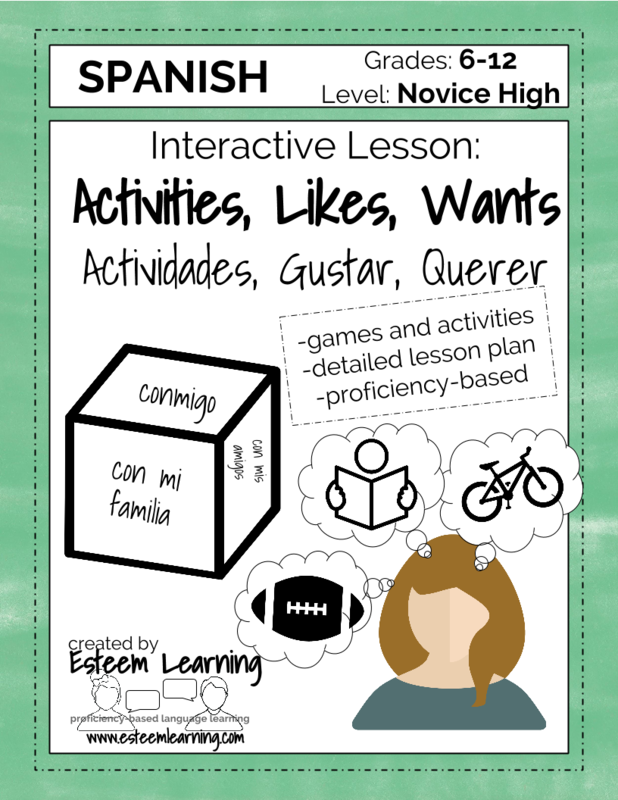 This 3-hour lesson on Activities, Likes and Wants (Actividades, Gustar y Querer) uses fun and dynamic learning activities to teach these useful and commonly-used concepts and vocabulary. Product Update - Target Language Posters in Spanish! BUY IT HERE in Italian! This quick and fun game helps students review and practice their present tense conjugating skills. -printable puzzle - just cut and go! This is a simple, fun and interactive game to help earners practice their vocabulary in a fun and dynamic way. They have to work together and compete against other teams to put a puzzle back together, and the only way they can do it is by practicing vocabulary! -printable puzzle - cut and go! This 2-hour lesson on family uses fun activities in learning stations to teach and review family vocabulary. This 3-hour lesson on colors uses fun activities and games to work on students’ writing, speaking, and listening. This Travel Unit includes five 1-hour lessons intended to give students contextual and meaningful practice with common travel experiences. All lessons are provide detailed vocabulary lists followed by authentic contextual activities to give students real-world practice with common travel experiences and communication needs. By the end of the Unit, students will feel confident and ready to pick up their passports and go! Tired of practicing with body parts and doler in the same boring way? This 3-hour lesson uses fun activities and games to practice with these concepts in dynamic ways. With monsters, Guess Who, and other fun activities, this lesson is a great way for students to practice and solidify their understanding and ability to use these terms and concepts. ACTFL’s Can-Do Statements help learners identify what they need to do to function at a specific level of proficiency. But how can we make these clear and evident for students? These posters are a great way to make these benchmarks visible for students. Whether you’re a veteran or just newly transitioning to proficiency-based curriculum, these posters are a fantastic addition to your classroom. BUY THEM HERE in English! BUY THEM HERE in French! BUY THEM HERE in Spanish! -Post these posters around the room to help integrate curriculum and student buy-in. Hearing a lot of English in your Spanish class? This tablemat has all the small phrases that students need to feel confident about speaking in class. It is colorful and makes common phrases accessible to students. 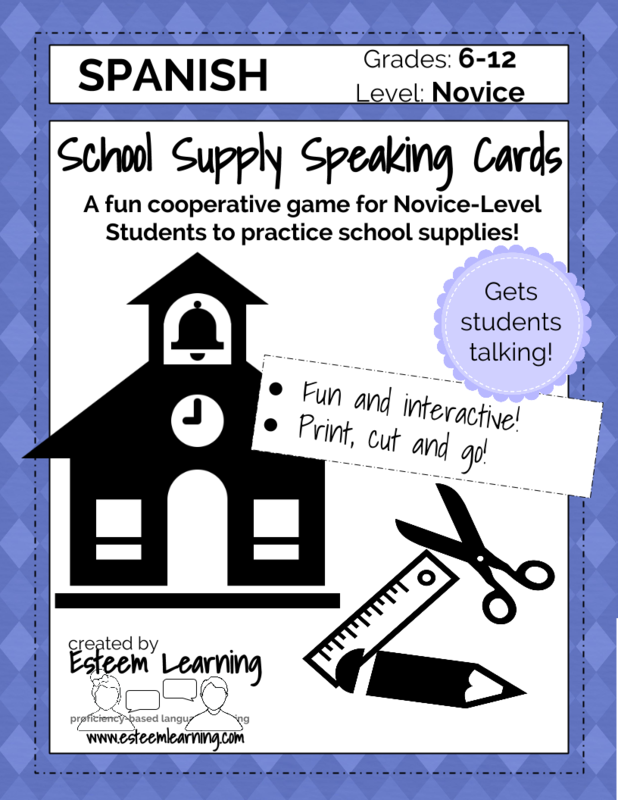 Laminate a copy for each desk, and students will be participating in no time! One of the most difficult things about teaching Spanish is to get students to participate! Besides making a welcoming environment, what else can you do? Most of the time, students are nervous to participate because they "don't know what to say." We throw so much information at them that it can be hard for them to process it all when they're trying to speak on the fly. Enter - the FREE Spanish Tablemat. Buy it here! This small resource has huge effects - I laminate one for each desk, and students are raising their hands in no time. It's an at-a-glance resource and security blanket...whatever they may need to say is on the sheet! Watch participation go up when you empower your students by giving them access to what they need. When you're teaching a World Language, sometimes it seems like there is no end to vocabulary lists! Students may groan when you introduce new words in class, but with Brainwreck, the'll look forward to practice with their new terms. This game, based loosely on the concept of Cranium, requires students to use kinesthetic, visual, written, verbal, and non-linguistic representation to describe the vocabulary words on their cards. Brainwreck is a way to practice vocabulary in an exciting and dynamic way! Add vocabulary words from your current unit, and you’re set to go. By the end of the game, your students will know their vocabulary backwards and forwards! Are you tired of teaching students vocabulary or grammar topics only to have them forget by the next class? Or worse, have them be able to read and write but not say a word? Enter proficiency-based learning. This type of teaching focuses on what the students will be able to do with the language, not what they know about it. New on Teachers Pay Teachers is a three-day proficiency-based lesson plan to teach beginners colors in Spanish. Best of all, they’ll actually be able to use them! These first few concepts are some of the most important and useful your students will ever learn, and this Lesson Plan helps you make the most of it! It works on students’ writing, speaking and listening. Don't need the whole lesson? You can buy parts of it to supplement your lesson!